Match-winner Tom Nichols (left) and substitute Harry Beautyman celebrate the Posh win in front of the visiting fans at Chesterfield. Photo: Joe Dent/theposh.com. There was some great defensive work from Peterborough United as they edged a 1-0 League One win at Chesterfield despite finishing the game with nine men. 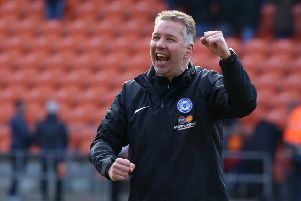 Michael Smith and Ricardo Santos were the men to see red cards, but central defender Michael The Boss’ Bostwick and co made sure Posh held onto a goal scored by debutant Tom Nichols. Posh striker Shaq Coulthirst holds off Chesterfield defeneder Sam Hird. Photo: Joe Dent/theposh.com. And then there were nine! Posh central defender Ricardo Santos collects his second yellow card at Chesterfield. Photo: Joe Dent/theposh.com.